Another little snippet. Mr. Barnett decided to use the Kent Football Scheme whereby the County would loan the Tech a qualified super coach for the school`s football team. They were doing very well and very keen on the game and Mr. B thought a special footballer would help them more. After a week or two Mr. B happened to pass the changing rooms and he heard this specialist training the team on different methods on how to foul your opponent and get away with it. Mr. B burst into the changing room and told the coach to leave and not come back, ever. Mr. B did think of his boys !!!! The Tech ran a house system whilst I was there and recently I have been racking my brains trying to remember not only my own house but the names of the others. All I can remember is that they were named after famous engineers or scientists. Any one got any ideas? 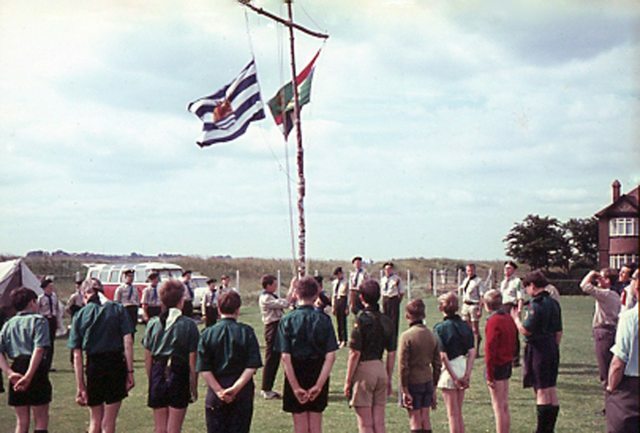 I put this photo up sometime ago on the scout page but it has disappeared into the wastes of cyberland.It shows the school scout troop and a visiting Dutch troop in, I guess, 68 or 69 up at the school playing field, the canal bank is behind. Unfortunately nobody is immediately recognisable although I believe the scout on the right next to the lad in the red top could be Albert Port. conan, the newsagents I was referring to was called Snooks when I was a boy in Sheerness, next door to W H Barons TV shop, near to the town clock. They had another shop in the High Street. Derek Lynch bought the business and later it became Sheerness Travel Agency. The shop opposite the school on the corner of Meyrick Road was called "Fletchers" in my time. They lived on the premises and it always amused me that Mr Fletcher would work in the shop in his carpet slippers. The first one shows fellow band member Mark Reader. I think it was taken in the room at the top of the left hand stairs. Behind the window would be the corridor leading to the staff room and woodwork shop. Number two is another gym shot of below knee football, showing the wall bars. And finally, Phil Goodwin having a break. Thanks for the memories Timjen, I didn't know Biffo had passed away but then I've been out of the loop as far as the old place is concerned since I left, unlamented, in 1969. Was the newsagents you mentioned the one opposite the school?, I remember the owner used to sell individual fags and a red match for thruppence, thus helping an addiction that I still curse 45 years later. I must admit that when I went back some years ago and saw what ''they'' had done not only to the Broadway but to much of the rest of the town, I nearly wept. Sometimes progress and the march of time can really get one down. Thank you again conan. I think the picture with Mr Jackson is quite poignant. He of course is sadly no longer with us, but also the only thing in the whole picture which remains unchanged is the Catholic Church, just visible in the background. He taught us economics as well as history and I remember having to buy financial newspapers from Derek Lynch, a really lovely man, who continued to operate the newsagents in the Broadway for some time after Mr Snook sold up. Here's another shot of Mr Jackson. Thank you conan and John38. I laughed at the baloney football comment, I thought exactly the same thing. Here are a few more memories. The first image is Terry Spice again at the old swimming pool, standing between the main pool and the learners pool. The second one is Biffo Jackson.The group to the right are Robin George, Keith Thompson and Ashley Underwood. Next row down are ?? White and I think Trevor Watkins. The third image is the band again, practicing in the corner of the main hall. And finally, Robert Grimsdale hanging off of the diving board. That's a great set of photos Timjen. Lovely to see the old interiors again, Owen 'Jack' Ryder striding away from what was Jim Hutleys geography room, the old physics lab, and the gym with below knee football that I spent the first year convinced was called baloney football, a bench on its side was the goal. The gym was also used as the meeting place for the school scouts [9th Sheppey] so seeing the picture of Brian 'Dobbin' Palmer who was the scoutmaster and Terry Spice who was assistant together was rather neat. Really interesting - keep 'em coming! Sorry about the confusion over image size. The first shows the Physics lab. From left to right are John Nurden, Glen Rogers, with Robin George doing his best "Clonk" Clenaghan impression. Second was taken at the old Sheerness swimming pool, with the older school building in the background. Third was taken in room 5 I think, again sorry for the quality, it also suffered light fogging. Pictured are Phil Goodwin, unknown, Ivan Hurket, Terry Pack, Colin Brooks, unknown, and Filmer Wellard. And finally, the gym, and the world famous "below knee football". Left to right, Filmer Wellard, Ralph Leach?, Barry Spokes, Peter Glock, John Nurden, Terry Spice. I'll keep digging to see if there are any more, if you're interested. Thank you, here are the images in the order listed below. Probably too largeTimjen. Try reducing to 800 or less. Well that's embarrassing, I attached the images and they have vanished? Sorry CDP, that is the only image you feature in. The film was fogged in the first place and 44 years has taken it's toll on the negatives. Thank you for the comment conan, here are some more. The first one shows Owen "Jack" Ryder in the woodwork shop. I have no idea who the boys are. The second one is Mr Ryder again, walking past room 4. You can clearly see the school was being boxed up, ready for closure. And finally for today, Brian Palmer and Terry Spice. I have no idea how I've got this negative, I certainly didn't take the picture. I may have "borrowed" it from CDP's dark room.